Polar Band for therapeutic or fitness exercises. Resistance levels are determined by thickness of the band. Available in 5 levels. 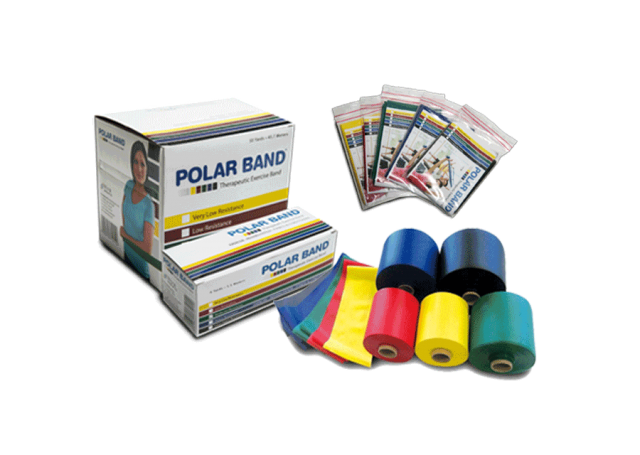 Polar Bands and tubes provides both positive and negative force on the muscles, improves strength, range of motion and cooperation of muscle groups. Polar Band Exercise bands can be used in physical therapy clinics, hospitals, home health care and the fitness field. Lots of excersizes can be made with resistance bands and tubes. You don’t need expensive equipment to train your body or to do excersizes in your rehabilitation. One peace of polar band or tube can replace the equipment you are using, and it can be done just any ware. 5,5 m and 45,7 m in rolls packed in boxes. Test the Polar Bands and Tubes at one of our Exhibitions or visit our Showroom. • Bright attractive finish and colors.